We believe larp can change the world. That it’s harder to disrespect, have prejudices against, or start a war with someone when you have been in their shoes. By creating international networks, sharing experiences and reflecting upon them we believe larp can promote understanding and create a better world to live in. The goal of the Larpwriter summer school is to create this international network and to empower it's participants with the experiences and the tools they need to create their own roleplaying games and larps. 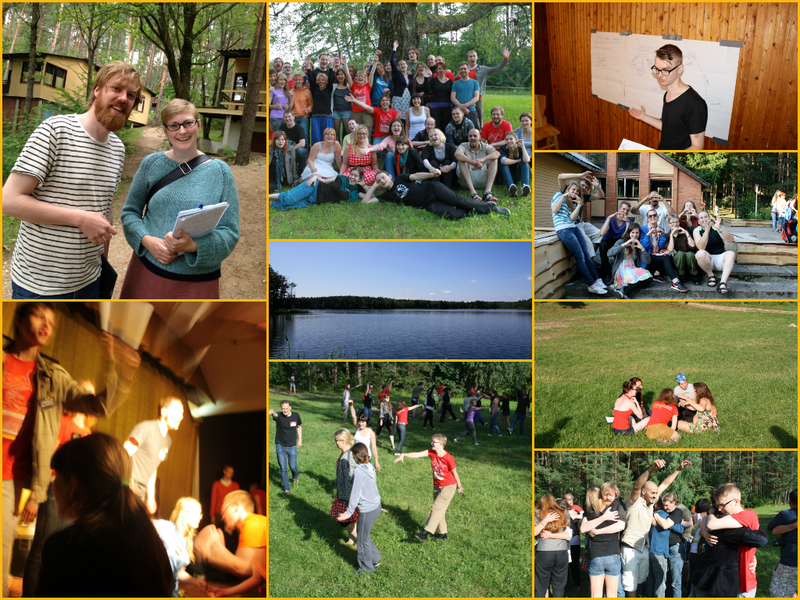 The Larpwriter summer school is designed to take participants with little or no larp experience to the level where they have the tools and enthusiasm to organize their own larps. Besides the learning, the Summer School is a magical place of new friends, late-night swimming and good times. Some snapshots from previous Larpwriter Summer Schools. This year's summer school will be held from the 3th to the 8th of July. The bus for the summer school venue leaves early morning on Sunday July 3th, so we recommend all participants to schedule for arrival on the evening of Saturday July 2th. The Larpwriter Summer School is free of charge, but the participants should cover travel costs to and from Vilnius. The Summer School ends on Sunday 8th of July. It will be possible to catch a late flight after the school ends, but we recommend all participants to stay till Monday (or Sunday) to enjoy some time in Vilnius with your new friends. The location is Ruta, a cabin resort outside of Vilnius, Lithuania. International (non-belarussian) participants cover their own travel expenses to Vilnius. For a small fee, visas and travel for Belarussian participants will be organized collectively from Minsk. The programme at the Larpwriter Summer School is a careful selected combination of actual larps and roleplaying games, physical workshops and lectures. Unlike the programme on many other larp-related events, there is only one single track because we want all participants to follow the same course and thus share the same experiences. The how: Workshops and lectures on the nuts and bolts of larp design. We will host a new Larporatory in Vilnius on 25-27th of November 2016. The Larporatory is primarily for the participants at the Larpwriter Summer School 2016. The Larporatory is a practical follow up to the Summer School. The goal is to design a playable larp in two days and then playtest it on the third day. We encourage to signing up with already formed groups and larp ideas. It is possible to apply to bring people who have not attended the Larpwriter Summer School (LWSS) before if you want to design a larp with them. Based on our previous experience we have decided to allow groups of 2-4 people. It is also possible to sign up without a group or an idea, we will then facilitate a process for forming or joining groups. Please bear in mind that there will be limited time to work on the larp during the Larporatory. The play testing sessions on the third day can last a maximum of four hours, and the amount of players will probably be limited to approximately 10. We also have limited resources for props and black box venues, so we encourage you to think of flexible larp designs. During the Larporatory all groups will have a facilitator who will follow your group throughout the process. The facilitators are also previous members of the LWSS and have themselves earlier produced a larp at the Larporatory. Some of the speakers and facilitators from the Summer School will also be present and serve as expert conselors for the groups. We start early on Friday 25th of November, so you need to arrive on the Thursday 24th. We are hosting a dinner at 21:00 on the 24th in Vilnius. The Larporatory will start in the morning on the 25th and last until evening the 27th. There will of course be a party after the seminar is over. The Larporatory is free of charge, and accomadation and food will be covered. You need to pay for your own travel to and from Vilnius. Modernist theme | RSS Feed .